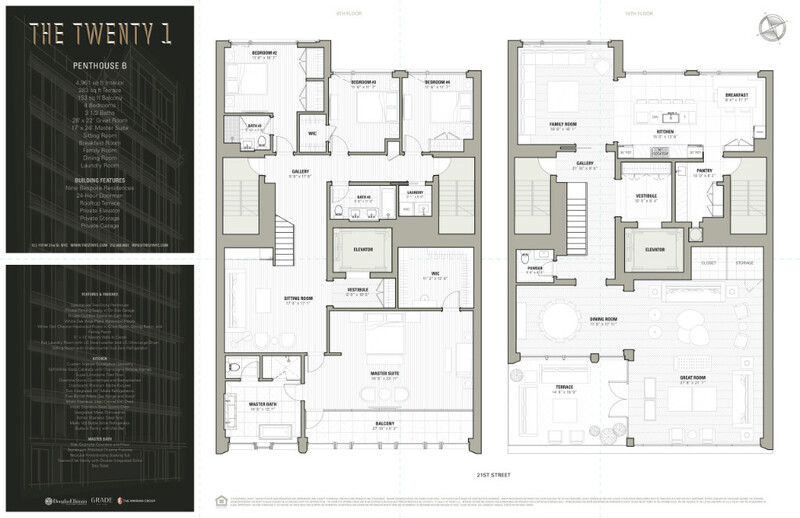 The extraordinary embodiment of sleek, innovative contemporary design, The Twenty 1 condominium is a brand new boutique residence setting a premium standard of luxury at the crossroads of prime Chelsea/West Flatiron. Spectacular Penthouse B epitomizes sophisticated downtown living with 2 sprawling light-drenched stories totaling 4,961 square feet, a large 340 sq foot balcony off the great room, a private 200 sq ft master suite balcony, and your own PRIVATE PARKING SPOT in the onsite garage. One of only 9 thoughtfully architected, meticulously appointed homes in this coveted building, the distinctive penthouse boasts 4 spacious bedrooms, 3 and a half elegant baths, and a breathtaking loft-like layout for seamless entertaining. Welcoming you home is a direct keyed elevator that opens into a private vestibule on both levels with honed Supai limestone flooring. From the entry gallery you are escorted into modern perfection, with the highest attention to every meticulous detail. Glamorizing the ambiance are massive floor-to-ceiling windows, rift cut custom stained oak millwork, wide plank white oak wood flooring in a Chevron pattern, the finest finishes, fixtures, stones and marbles, and many other superior refinements. A haven for indoor-outdoor entertaining, the 28' x 22' great room spills into the large open dining room and generously-sized terrace. The remarkable gourmet kitchen with stretching windows, a center dining island and breakfast area flows into the lovely family room with a sunny window wall. Culinary creations are inspired in the top-of-the-line kitchen styled with custom stained eucalyptus cabinetry, soft white glass cabinets with champagne bronze frames, Madre Perola quartzite stone countertops and backsplashes, a Supai limestone tiled floor, Dornbracht Platinum matte fixtures, and a butler's pantry with wet bar. The stellar Miele appliance package includes 2 integrated 30 refrigerators, a 5-burner gas range and hood, stainless steel convection and speed ovens, integrated dishwasher and 102-bottle wine fridge.The 17' x 24' master suite exudes luxury with its own sitting room featuring an under-counter Sub-Zero fridge, 11' x 13' walk-in closet, and spa bath with a stained oak vanity with double integrated sinks, slab quartzite counters and flooring, Dornbracht polished chrome fixtures, a freestanding Neptune soaking tub and Toto toilet. Abundant closets grace all the bedrooms. A full laundry room with an LG Steamwasher and Ultra-Large dryer enhances your convenience.Idyllically situated on prime West 21st Street between Avenue of the Americas and Seventh Avenue, The Twenty 1 offers 9 bespoke residences in downtown's most coveted locale with a 24-hour doorman, a private garage and breathtaking rooftop terrace. Coming January 2018.